Synthetic peptide within Human NRF1 aa 350-450 (Cysteine residue). The exact sequence is proprietary. WB: MCF-7, HeLa and 293T cell lysates and human fetal heart, mouse heart, mouse brain, rat heart and rat brain tissue lysates. IHC-P: Human gastric adenocarcinoma, human cervical carcinoma and human skeletal muscle tissues. ICC/IF: HeLa and MCF-7 cells. Flow Cyt: 293T cells. IP: 293T cell lysate. Our Abpromise guarantee covers the use of ab175932 in the following tested applications. WB 1/1000 - 1/10000. Predicted molecular weight: 54 kDa. Flow Cyt 1/10 - 1/150. Transcription factor that activates the expression of the EIF2S1 (EIF2-alpha) gene. Links the transcriptional modulation of key metabolic genes to cellular growth and development. Implicated in the control of nuclear genes required for respiration, heme biosynthesis, and mitochondrial DNA transcription and replication. Ubiquitously expressed with strongest expression in skeletal muscle. Belongs to the NRF1/Ewg family. Immunohistochemistry (Formalin/PFA-fixed paraffin-embedded sections) analysis of human cevical carcinoma tissue labelling NRF1 with purified ab175932 at a dilution of 1/100. Heat mediated antigen retrieval was performed using EDTA buffer pH 9. ab97051, a HRP-conjugated goat anti-rabbit IgG (H+L) was used as the secondary antibody (1/500). Negative control using PBS instead of primary antibody. Counterstained with hematoxylin. Immunocytochemistry/Immunofluorescence analysis of MCF-7 cells labelling NRF1 with purified ab175932 at a dilution of 1/100. Cells were fixed with 4% paraformaldehyde and permeabilized with 0.1% Triton X-100. ab150077, an Alexa Fluor® 488-conjugated goat anti-rabbit IgG (1/1000) was used as the secondary antibody. DAPI (blue) was used as the nuclear counterstain. ab7291, a mouse anti-tubulin (1/1000) and ab150120, an Alexa Fluor® 594-conjugated goat anti-mouse IgG (1/1000) were also used. Flow Cytometry analysis of 293T cells labelling NRF1 with purified ab175932 at a dilution of 1/150 (red). Cells were fixed with 80% methanol. 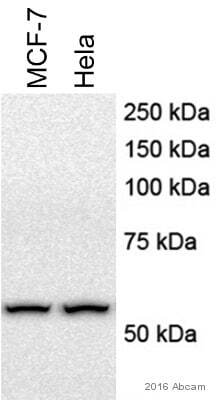 A FITC-conjugated goat anti-rabbit IgG (1/500) was used as the secondary antibody. Black - Isotype control, rabbit monoclonal IgG. Blue - Unlabelled control, cells without incubation with primary and secondary antibodies. ab175932 (purified) at a dilution of 1/50 immunoprecipitating NRF1 in 293T whole cell lysate. Lane 2 (+): ab175932 + 293T whole cell lysate. Lane 3 (-): Rabbit monoclonal IgG (ab172730) instead of ab175932 in 293T whole cell lysate. Immunocytochemistry/Immunofluorescence analysis of HeLa cells labeling NRF1 with unpurified ab175932 at a dilution of 1/50. ab175932 (unpurified) at a dilution of 1/10 immunoprecipitating NRF1 in 293T cell lysate. Flow cytometric analysis of permeabilized 293T cells labeling NRF1 with unpurified ab175932 at a dilution of 1/10 (red) compared to a negative control (rabbit IgG, green). Immunohistochemistry (Formalin/PFA-fixed paraffin-embedded sections) analysis of human skeletal muscle tissue labeling NRF1 with unpurified ab175932 at a dilution of 1/50. Immunohistochemistry (Formalin/PFA-fixed paraffin-embedded sections) analysis of human gastric adenocarcinoma tissue labeling NRF1 with unpurified ab175932 at a dilution of 1/50. Publishing research using ab175932? Please let us know so that we can cite the reference in this datasheet.